Ella changes favorite books about the way I change socks (so, every three days, when I go running). What was a favorite a few months ago may now be languishing on the shelf. As the primary reader in the family, this doesn’t bother me a bit – I’m glad to see new books come out and some retire for a bit. Of course, new books mean I have to get back up to speed before I can read them with my eyes shut on the couch. Animal 123 – Ella loves a book with flaps, and this one doesn’t seem likely to tear (not even a nick after months of reading it). The colors are beautiful, it’s not too long, and it’s just an extraordinarily nice book for a young child. Curious Baby: Everyday Shapes – I mentioned this book in my “Day in the Life” post and that I didn’t really like it, but I’ve warmed to it. As Ella gets older, this is a great book for her fine motor skills as she practices getting the puzzle pieces in and out, and she’s gotten really good at identifying shapes. More – I’ve been a fan of Brian Lies since Bats in the Library, and this one is another winner. It makes Ella laugh every time we read it. Plus it is ligggggght on the text, which I secretly love. Because I am a bad mother. Curious George Goes to the Hospital – I . . . do not have a lot of tolerance for Curious George. Have we no self control instincts whatsoever (yes, I know he’s a monkey. Still, it irks me)? Also, these books are long. But I read it because my child loves it. I will admit to major abridging, though. Nursery Rhyme Treasury – I won this at a baby shower and had no intentions of ever opening it, but Ella picked it up one day and we both really like it. Except when she picks it as her bedtime story and I have to try and flip thirty pages at once because, no, I do not read 75 pages books for bedtime. The Lion and the Mouse – I bought this for Ella’s birthday last year and it’s been in heavy rotation since. She loves the many animals and sometimes she reads it backward. Don’t ask me, I’m just the mom. Penny and Her Song – This has four short chapters, so I’ve been surprised that Ella can sit through it. After a few readings, she even started singing the little song (to the tune I made up). I Know a Lot of Things – Angela recommended this one and Ella loved it, despite it being. . .weird. Sweet, but weird. Mrs. Harkness and the Panda – I love Melissa Sweet, and so when Abby the Librarian mentioned this one, I immediately picked it up. It’s a little too text-heavy for Ella right now, but she loves looking at the bright illustrations and especially loves when the panda makes his appearance. The Runaway Bunny – Bart bought this for her on clearance for Christmas (I’d never even read it that I can remember) and she loves identifying the “baby bunny” and “mama bunny” on every page. 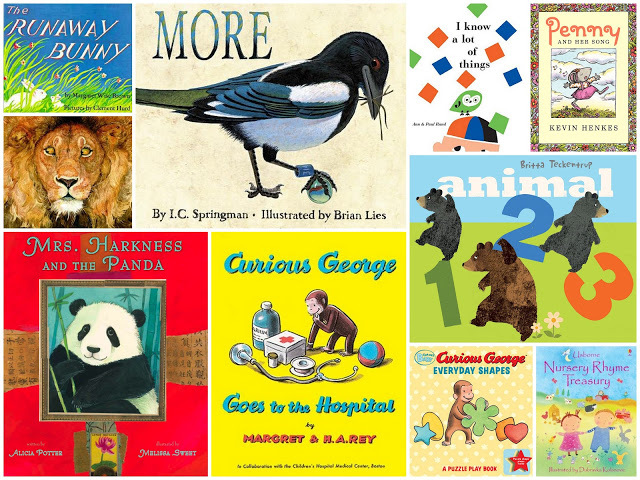 You can see previous picture book favorites here. If you want even more ideas about books to read with your children (or for older children to read on their own), I wrote a post for Work It, Mom! about five of my favorite resources for finding new titles. The Runaway Bunny was one of my childhood favorites! I love it (but isn't it a little creepy how the mom follows the baby by turning into different things? No? Just me?) (I didn't think it was creepy in the least when I was a kid.) (And I love it anyway.). Curious George Goes to the Hospital has been a favorite for ALL of my six kids. I used to dread when they would pick it off the shelf, just because reading it meant spending more time… and then after a few kids, I realized there's nothing I love to do more. So now it's one of MY favorites, too! I, too, dislike Curious George. Luckily, none of those books ever made it home to be read.